Trans Maldivian Airways “TMA” provides seaplane transfers to/from the TMA Terminal at the Velana International Airport “VIA” to coincide with the arrival/departure of international flights.­The seaplane transfer time from the TMA Terminal to Veligandu is about 20 minutes. 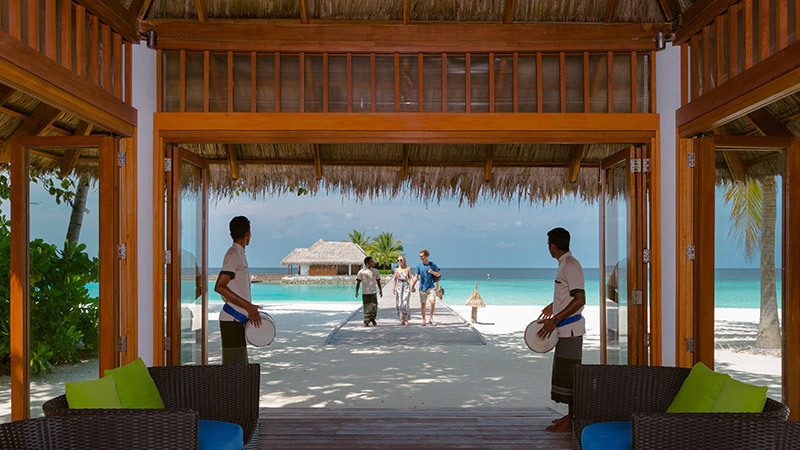 Typically, upon arrival in the Maldives, after clearing Immigration and Customs formalities, the guest will exit the Customs area and enter the Arrivals Hall, proceed to the nearby Crown & Champa Resorts Booth #18, where a Representative will assist the guest. ­A guest is transferred from the International Arrival Terminal to the TMA Terminal, about a 10-minute shuttle bus ride, and waits at the CCR Lounge before a scheduled seaplane transfer departs for Veligandu. The seaplane to Veligandu is normally scheduled to depart within one hour of all guests clearing Immigration and Customs. In rare instances, such as if an international flight arrival is delayed or a baggage claim form­must be completed, then the wait would usually be longer.­ While we do not assure the length of the waiting period at the CCR Lounge would be, all efforts would be made between Veligandu and TMA to fly our guests at the earliest possible time.­ If a guest has to wait for more than two hours, TMA provides sandwiches and in very rare instances, if delays are over four hours, a hot meal is served. Seaplanes fly during daylight hours only, i.e., between about 0600 and 1800. Airline policy requires passengers to check-in no later than 2 hours before flight time, therefore a Veligandu guest can connect by seaplane only to international flights departing VIA after 0900. Also, the last seaplane departure from Veligandu is about 1600. Guests arriving on an international flight from which it is not possible to connect with the last seaplane departure from the TMA Terminal (the guest must check-in at the TMA Terminal no later than 1600) may choose to overnight at Champa Central Hotel, Male’, or remain at the Airport. Such matters are handled by the guest’s local ground handling agent. Crown & Champa Resorts “CCR” Lounge serves all Veligandu and Vilamendhoo guests flying TMA. The CCR Lounge is located on the ground floor of the TMA Terminal A, in front of the elevator (through the double glass doors beside the main TMA check-in counter). The CCR Lounge is nicely decorated and furnished with comfortable chairs, couches and tables, and as well, chairs on the outside deck. The CCR Lounge staff welcomes all passengers with a refreshing, cold face towel, then assists them to complete their registration form so upon arrival at Resort, they are escorted to their room, quickly. Passengers are welcome to help themselves to a bottle of water, a soft drink, or tea or coffee; and a light snack menu is available at reasonable prices. Food is prepared in the nearby TMA kitchen. The CCR Lounge also features a Cyber Café with high speed, broadband internet connection, email and web browsing, at no charge; and as well, wireless internet connection for your laptop at no charge. The CCR Lounge also provides the convenience of separate restrooms for men and women. The CCR Lounge also provides a large screen colour satellite TV for viewing international news and another monitor with seaplane flight schedules. The CCR Lounge hours are from 0630 to 1830, or longer as needed. The CCR Lounge is for guests departing to Resort, not for guests returning from Resort to connect to their ongoing flight or other connections. Use of the CCR Lounge, and the above-mentioned services and amenities, are now provided at no charge. This policy is subject to change.